The Eastern Bluebird was chosen for TWRA's Watchable Wildlife license plate because it is a common Tennessee bird that people have benefitted by putting up bluebird boxes. This small thrush is a year round resident and can often be seen hunting along roadsides from a fence or low perch. The breeding range of the Eastern Bluebird extends across the eastern half of North America southward into Central America. The northernmost nesters migrate to the southern part of the breeding range in winter. Description: This medium-sized songbird has a large, round head, and a blue back, wings and tail. The chest is orange, the lower belly is white, and the male is brighter than the female. Juveniles (May-August) have a spotted chest and back with blue in the wings and tail. Voice: The song is a soft musical cheer cheerful charmer melody. The call notes are raspy and scolding. No other songbird in Tennessee has a blue back and orange breast. Habitat: Open habitats with little or no groundcover such as orchards, open woodlands, clear-cuts, parks, and large lawns in suburban and rural areas. Diet: Insects and small fruits. Nesting and reproduction: Eastern Bluebirds are cavity nesters and typically have 2 broods each year, sometimes 3, and rarely 4. Eastern Bluebirds suffer from competition with European Starlings and House Sparrows for nest sites, but the thousands of nest boxes that have been erected appear to off-set these detrimental effects (see link below for nest box designs that exclude starlings). Clutch Size: Usually 4 to 5 eggs with a range of 3 to 7. In Tennessee first clutches are commonly laid in March, last clutches in July or August. Fledging: The young are fed by both parents and fledge in 15 to18 days. Young produced in early nests usually leave their parents in summer, but young from later nests frequently stay with their parents over the winter. Nest: Bluebirds depend on naturally occurring cavities, tree cavities excavated by other species, or nest boxes. The female builds the nest of grasses, and lines it with finer material. Nest Box Instructions here. Status in Tennessee: The Eastern Bluebird is a common permanent resident across the state though some individuals may migrate further south in winter. Populations appear to be stable, but vulnerable in especially severe winters. The clutch size of Eastern Bluebirds varies with latitude and longitude. 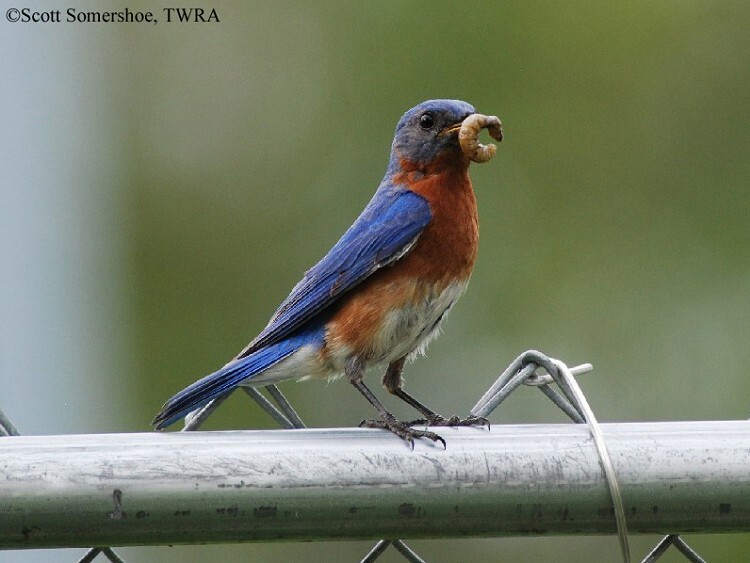 Bluebirds that nest farther north and farther west have larger clutches than southern nesters. In especially cold weather, several individuals will roost together in one cavity to stay warm. 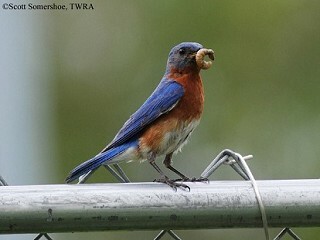 The oldest known Eastern Bluebird in the wild was 10 years 6 months old. Best places to see in Tennessee: Eastern Bluebirds are found in every county in the state. Many state and local parks have "bluebird trails" with multiple bluebird houses. Gowaty, P. A. and J. H. Plissner. 1998. Eastern Bluebird (Sialia sialis), The Birds of North America (A. Poole and F. Gill, eds.). The Academy of Natural Sciences, Philadelphia, PA, and The American Ornithologists' Union, Washington, D.C.